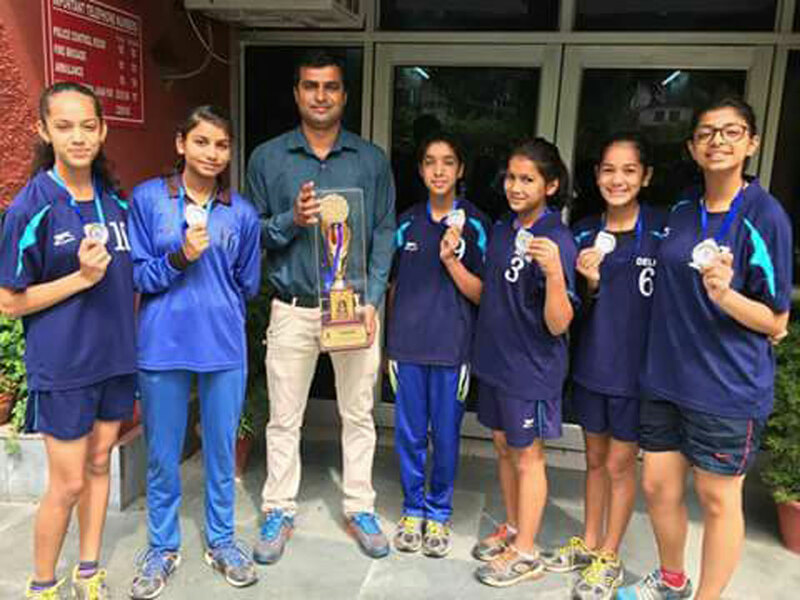 Six girls of our school were selected in the 64th School Games National Tournament under-14 girls secured III Position in the HANDBALL tournament was held at Hisar, Haryana from 10 January 2019 to 14 January 2019. 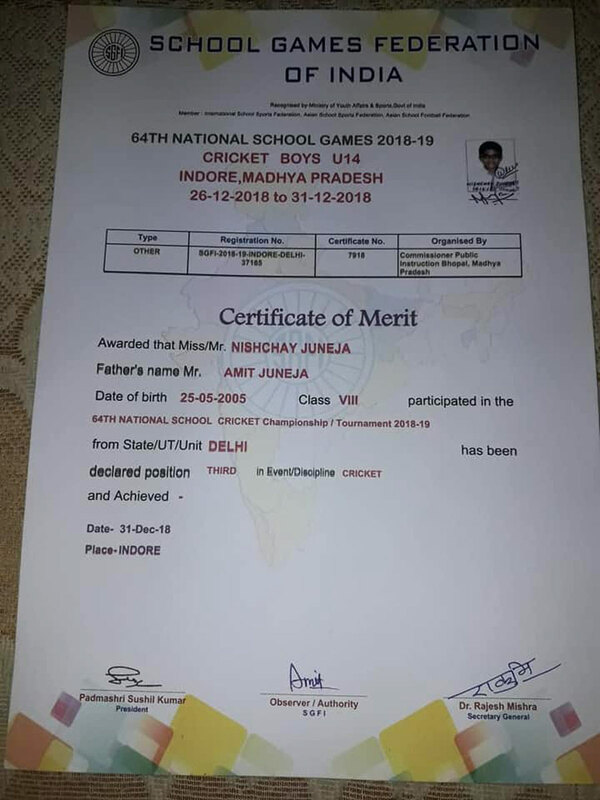 Nishchay Juneja, VIII A played in the "64th National School Games 2018-19 in under 14 cricket boys" held at Indore, M. P from 26 December - 31 December 2018. The team won third position in the game. These games are organized by the School Games Federation of India. 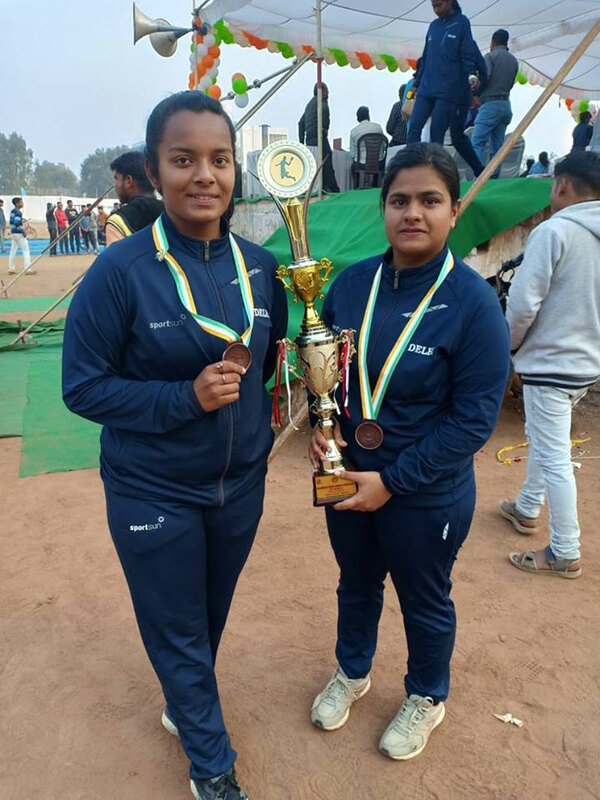 SHAGUN KUMARI and MUSKAN KANDWAL, our school handball team girls were selected to represent TEAM DELHI in the 64th SCHOOL NATIONAL GAMES UNDER-19 that were held at SHIVPURI, MADHYA PRADESH. The Delhi team secured 3rd position in the tournament. Proud of both of you !! Best wishes ! 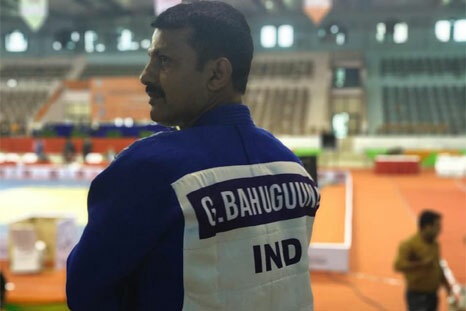 Mr. Girish Bahuguna, our school PET participated in an International level event GRAND MASTERS in Commonwealth Judo Championship 2018 held recently at Sawai Man Singh Stadium, Jaipur, India. 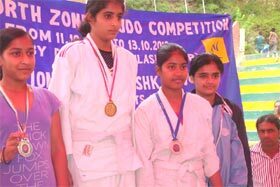 Manyata Suryan, VI-C and Kanika, VI-F of our school participated in Under 11 yrs, below 30 kg. 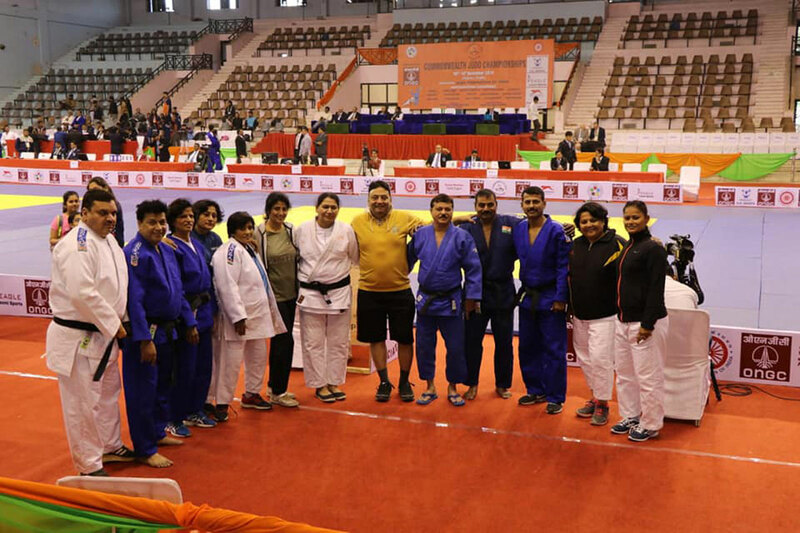 category, at the CBSE National Judo Championship 2018 held at Indian Modern Sr. Sec. School Sonipat, Haryana from 1 to 5 November 2018. 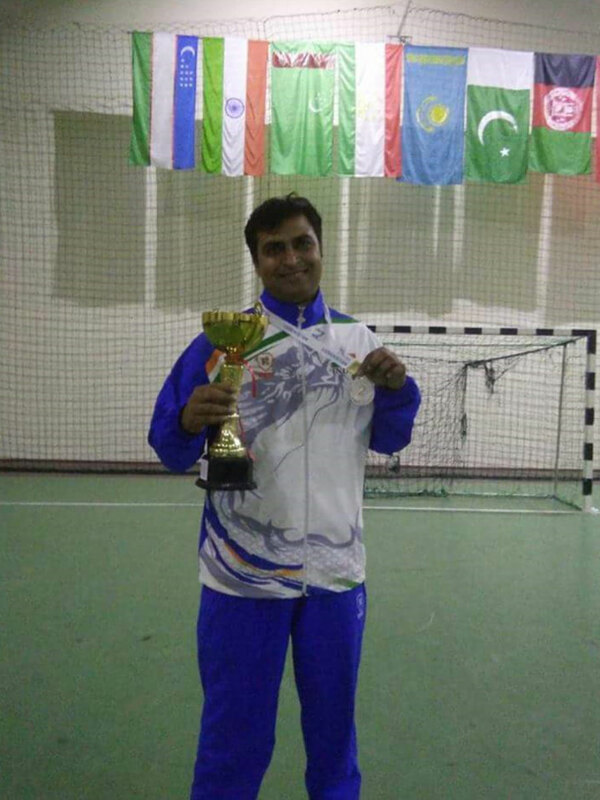 The Senior Indian Handball Team clinched Silver medal in the 27th Independence Handball Championship held at Taskent, Uzbekistan from 27th to 30th September 2018. 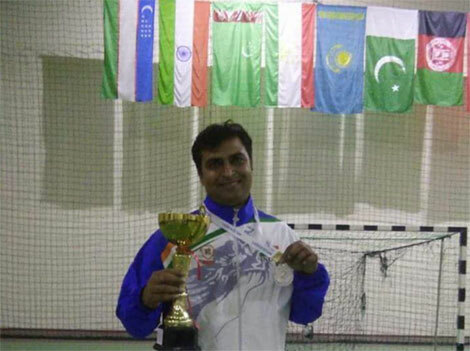 Congratulations Mr. Yogesh Kaushik and the Indian Team ! 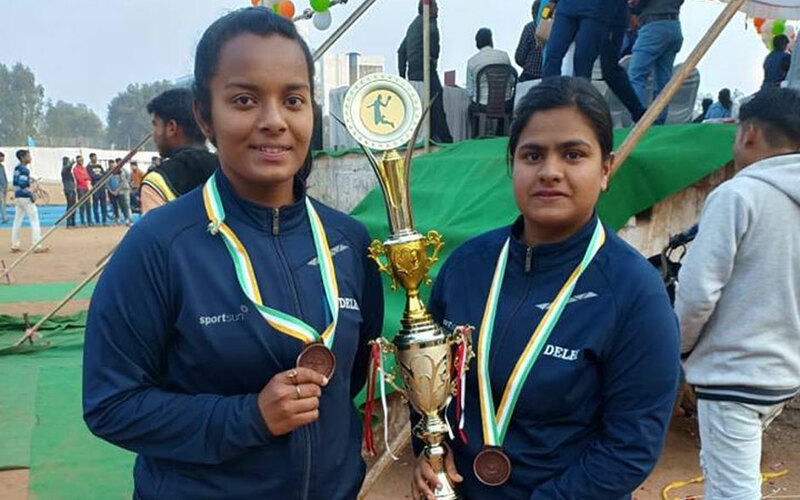 Shagun Kumari XII-D and Muskan Kandwal XII-B of our School Handball team were selected to represent ‘Delhi’ in 41st Junior National Handball Championship held at Baru Sahib, Himanchal Pradesh. The competition was held from 16 to 22 September 2018. Our students were selected to represent ‘Team Delhi’ in the 63rd School National Games in under-14 category, which was held at Bikaner, Rajasthan from 22 to 27 December 2017 and under-17 category, which was held at Mahabubnagar, Telangana from 10 to 14 February 2018. Their teams secured second. 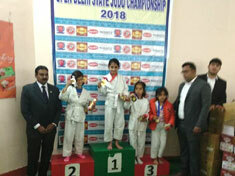 Shruti Kandwal IX-H, Khushi Kandwal IX-B, Sania Singh IX-D, Shagun Shukla VIII-C and Vidhi Goyal VI-D.
Shagun Kumari XI-D and Muskan Kandwal XI-B. 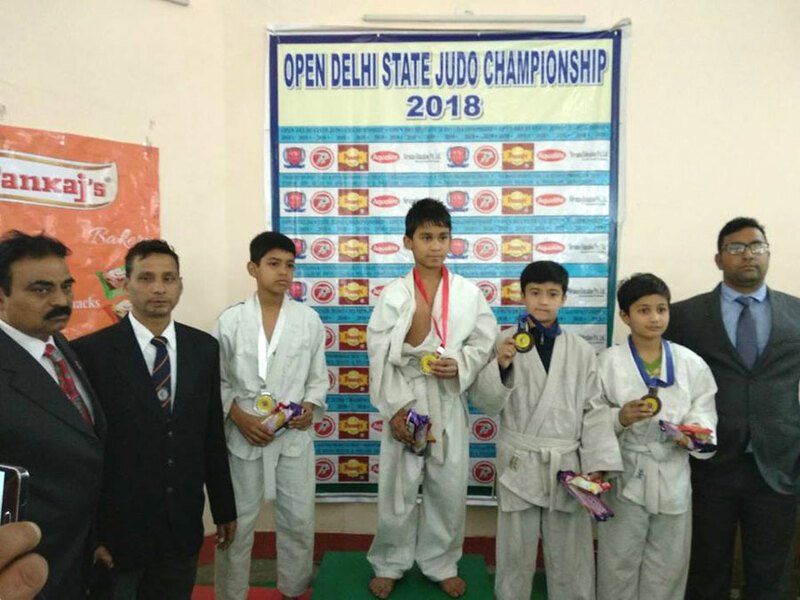 In the Open Delhi State Judo Championship 2018, held at Community Center, Sainik Vihar, Pitampura from 22 to 24 Jan. 2018, these students won Gold, Silver and Bronze medals for their remarkable performance. Way to go ! Proud of our Judo champs ! 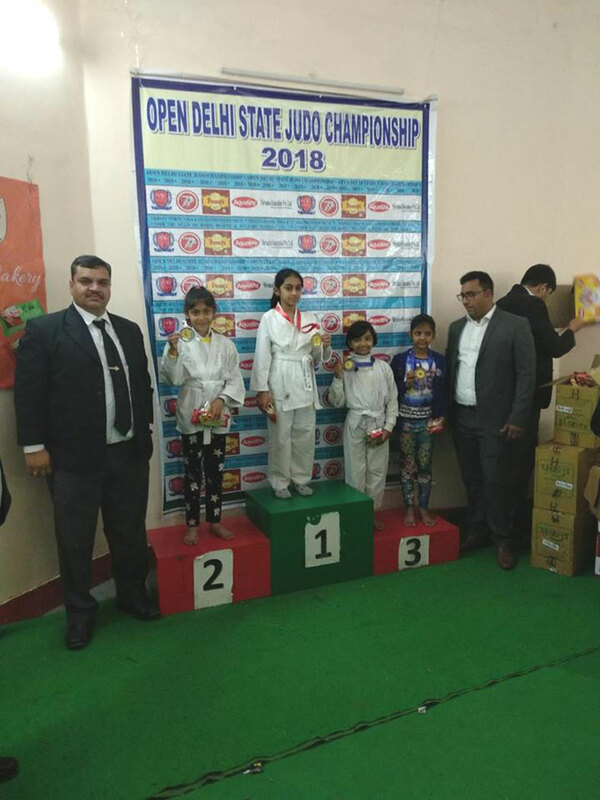 Muskan Kandwal, XI-B and Shagun Kumari, XI-D of our school were selected to represent ‘Delhi’ in Open Junior National Tournament held at Ranibennur, Karnataka from 7 to 19 October 2017. Our school handball team participated in CBSE Tournament at ‘Maharaja Agrasen Model School’ from 24 to 30 September 2017. Our team won Bronze medal. 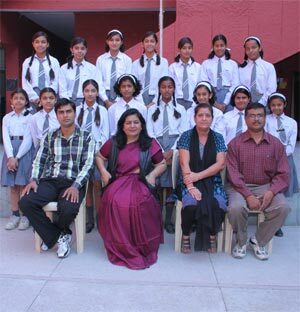 Shagun Kumari (XI-D), Nimisha Setia (XI-D), Muskan Kandwal (XI-B), Achint Kaur (XII-A), Janvi Kalra (X-A), Shruti Kandwal (IX-H). Yamini Solanki (IX-D) and Khushi Kandwal (IX-B). Our School Handball team members continue to learn laurels for themselves and the school with their spectacular performances. Muskan Kandwal (XI-B) was selected to represent ‘Delhi’ in North Zone Tournament held in Himachal Pradesh from 2 to 7 September 2017. Her team secured 3rd position in the tournament. 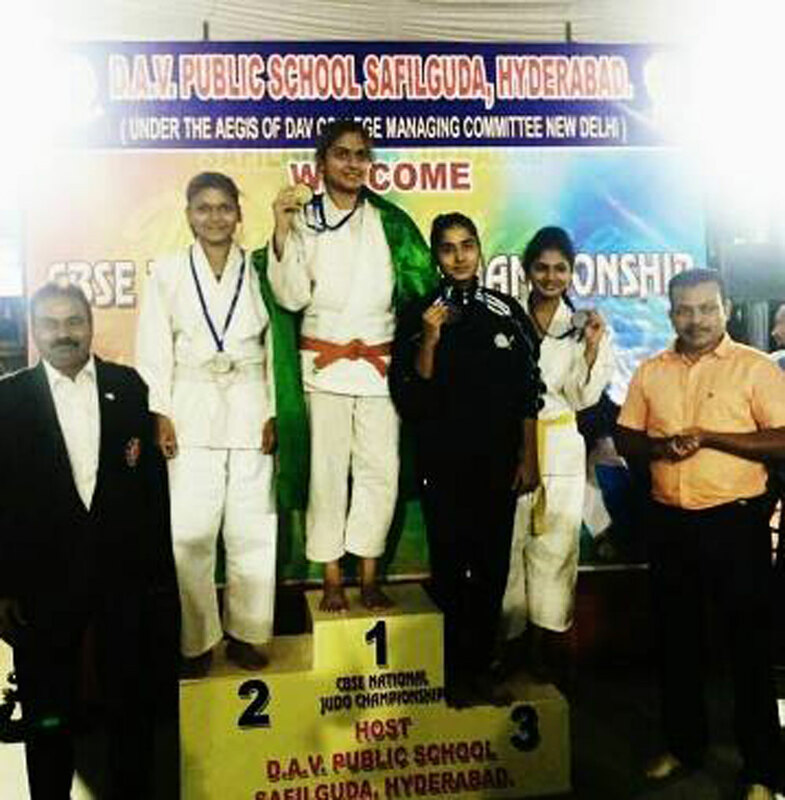 Mudra Rawat IX-A (Under 17) won BRONZE MEDAL and Vanshika Garg XII-A (Under 19) won SILVER MEDAL in CBSE National Judo Championship held at Hyderabad. 16th Mini Open National Handball Tournament was held at Hyderabad, Telangana from 4 June to 9 June 2017. 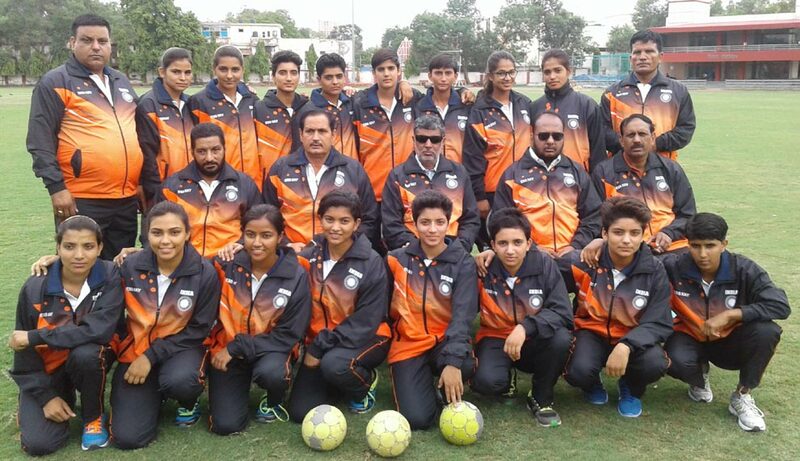 36th Open National Handball Tournament was held in Ghaziabad, Uttar Pradesh from 23 May to 29 May 2017. 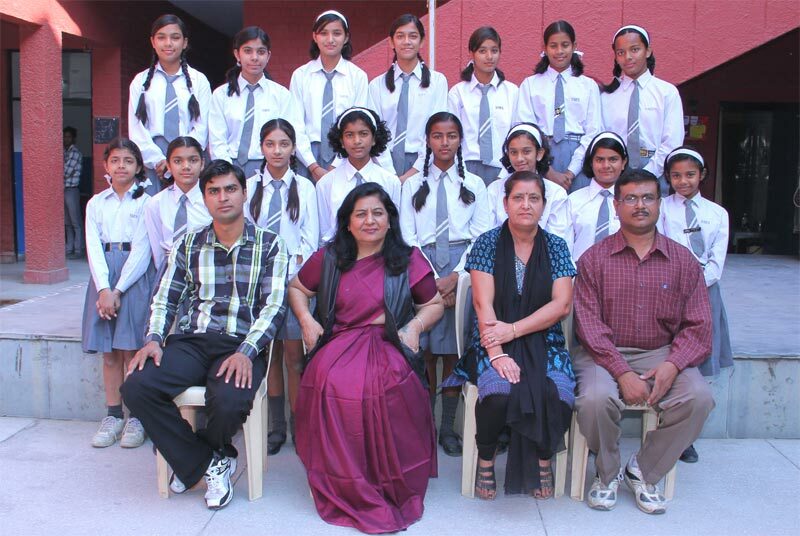 Following students of our school were selected to represent ‘Delhi’. 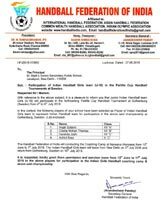 Open sub junior national handball tournament Held at Ghaziabad UP from 22 May to 29 May 2017. 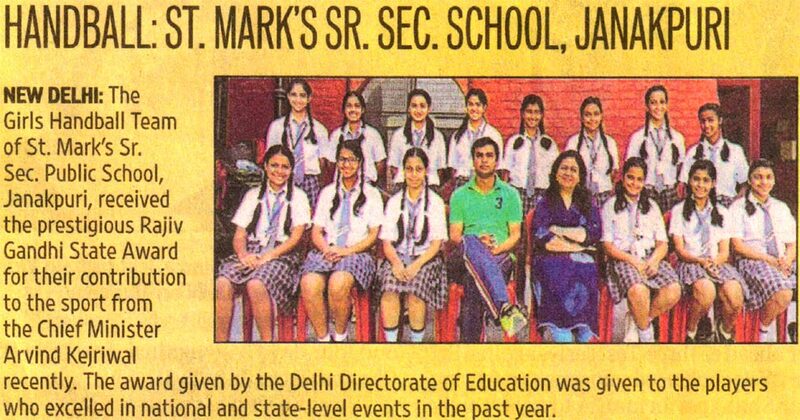 Six girls of our school represented Delhi, which secured second position. Tushar Khanna of XII-D won a gold medal in the Sr. National Basket Ball Tournament held from 5 to 7 May 2017. 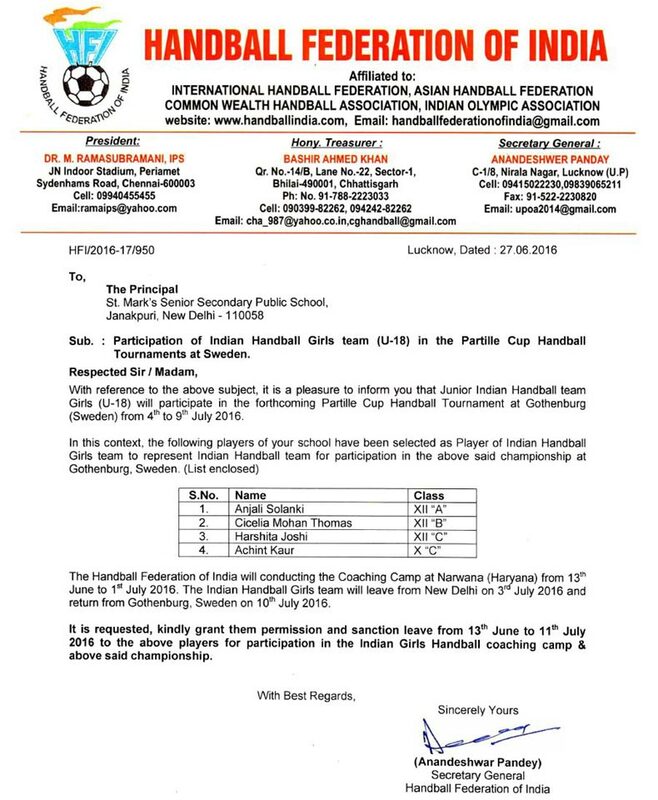 It was a feather in cap for the St. Markians when four girls of our institution were selected to represent India in Partille Cup Handball Championship which was held in Swedan. 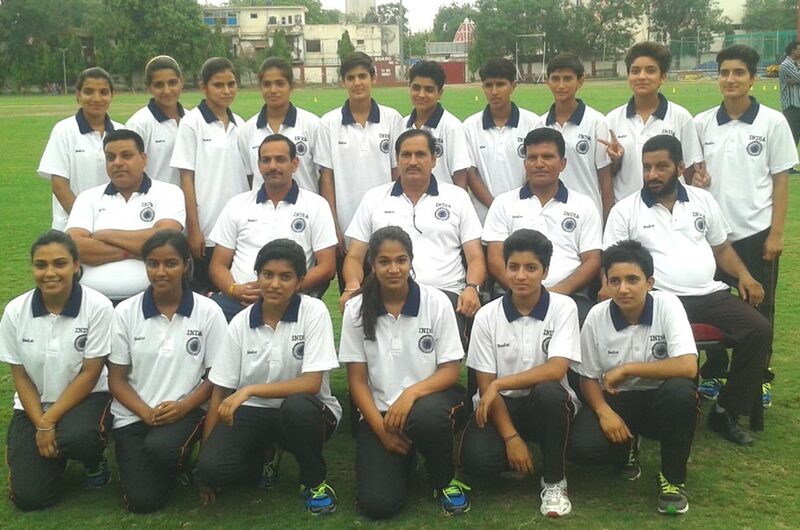 Before leaving for the International Tournament, the girls attended the coaching camp at Narwana, Haryana. 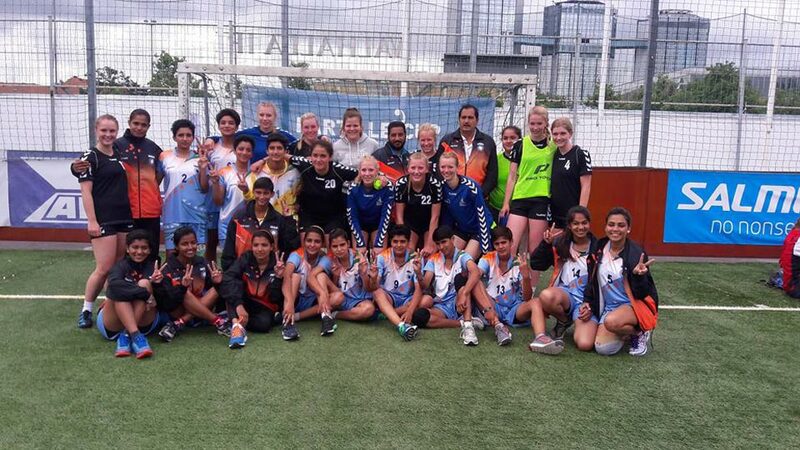 In this competition the girls defeated the teams of Germany, Swedan and Denmark. Thus successfully entering the Quarters but got knocked out by Norway. Nevertheless it was a great learning experience for them and an inspiration for the fellow players of the school. Our school Handball team and its star players have been regularly participating in various zonal, National and International competitions and winning laurels for themselves, raising the stature of our Country, State and School. Anjali Solanki, XII-A represented the North Zone in, Senior category, which participated at the National Tournament held at Jammu and Kashmir from 28 April to 30 April 2016. Her team secured Second Position. 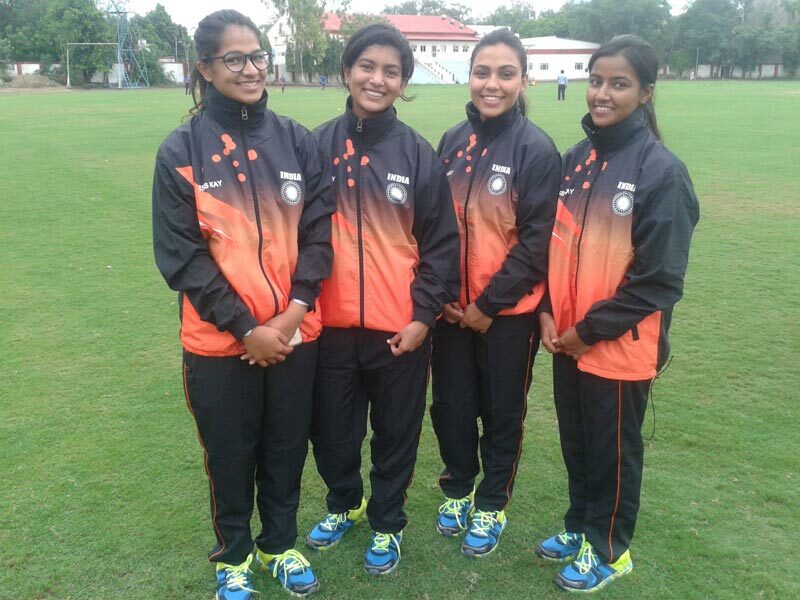 The following players representing team, in senior Category, which participated in the Federation Cup, held at Sangroor, Punjab from 5 May to 9 May 2016 - Anjali Solanki, XII-A, Cicelia Mohan Thomas XII-B & Harshita Joshi XII-C. 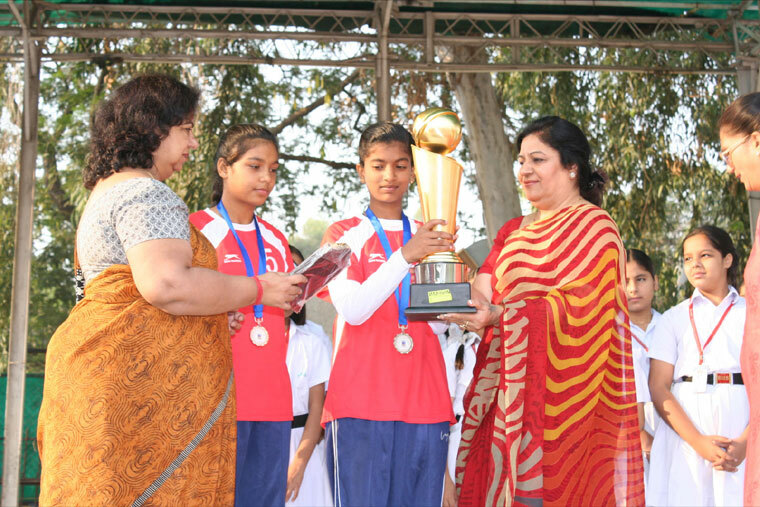 It was a proud moment for our school when 17 girls of our school received the prestigious Rajiv Gandhi State Award for their outstanding contribution in handball by the honourable Chief Minister Mr. Arvind Kejriwal. 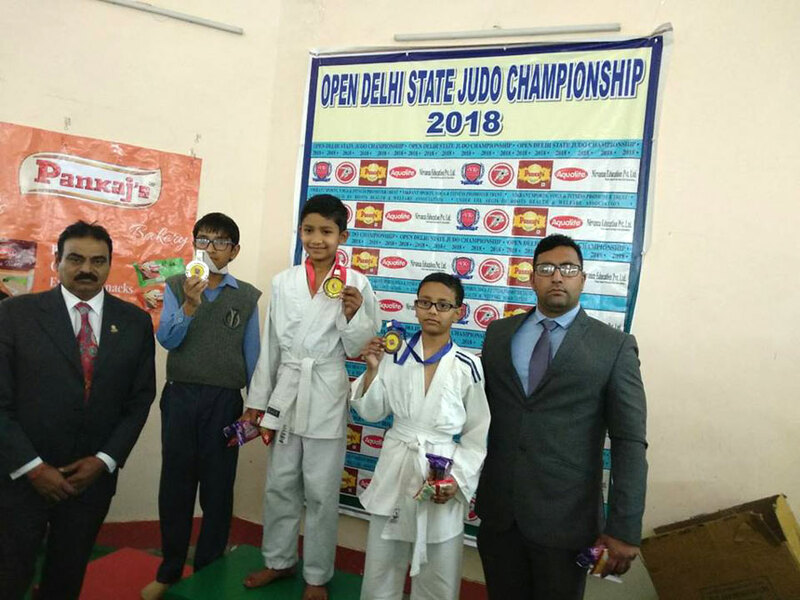 This award is given to those players who have achieved positions in Nationals and State Level in the past year and is given by Delhi Directorate of Education. 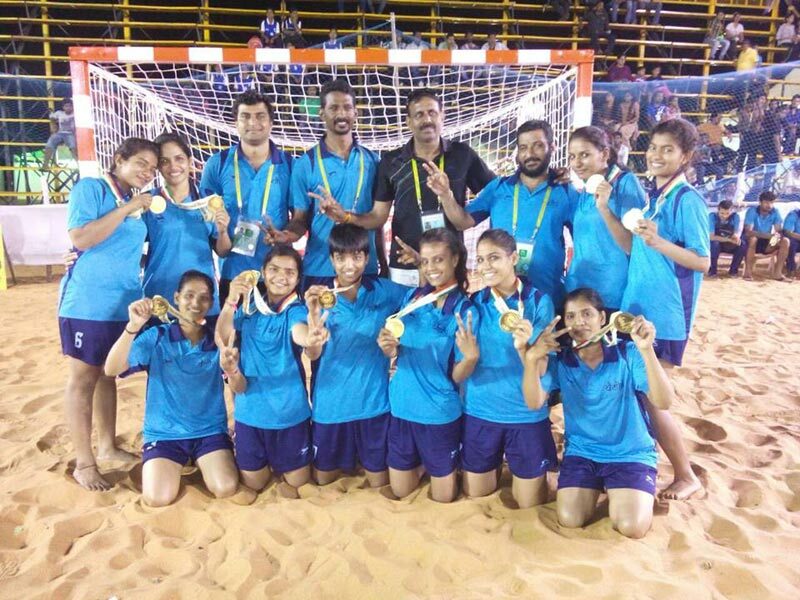 Cicelia Mohan Thomas represented Delhi team at 35th National Games - 2015, held at Thiruvananthapuram, Kerala, from 31 Jan. – 6 Feb. 2015 in Women Beach Handball event, which won 1st Position, a Gold Medal. Cicelia will be awarded Rs. One lakh cash prize by the Government of India, in recognition of her achievements in the game of Handball during the past 7 years. Sixteen year old Cicelia has made St. Mark’s Janakpuri family, Principal Ms. Rama Sethi and School Management proud by her winning ways. 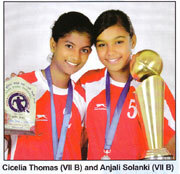 Starting at a very young age of 9 years, Cicelia has been winning consistently in many State Level Competitions. 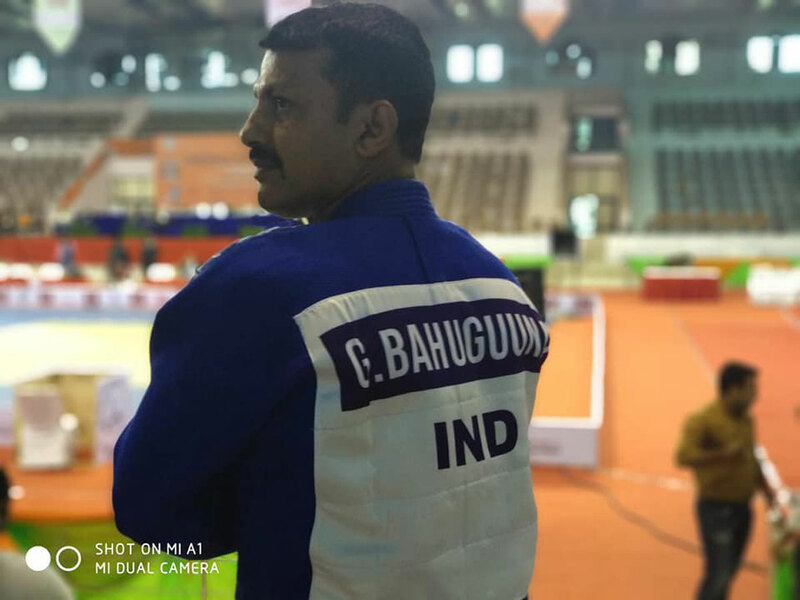 She captained the Delhi Team in the 30th Sub Junior Girls Open National Championship, the 57th, 58th & 60th National School Games. 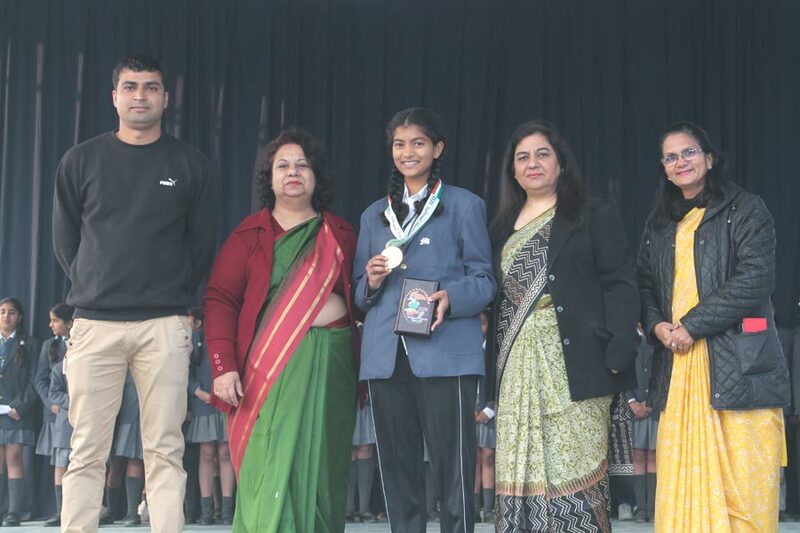 During the year 2014-15 Cecilia bagged 1st Place in the 60th National School Games held in Pitampura, New Delhi, in under 17 years Girls category. 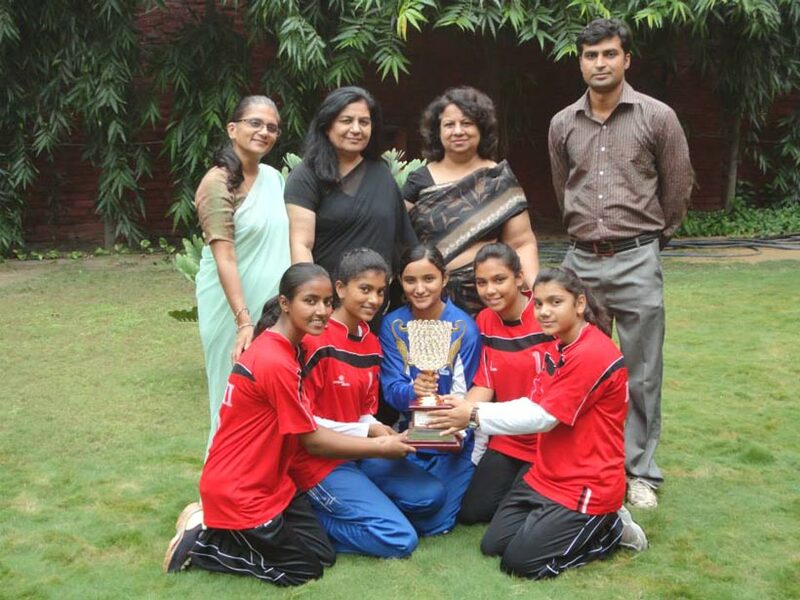 Her team also won the 1st position in the 25th Delhi State Handball Championship (Men & Women) at Pitampura, New Delhi. In her interview after her recent glorious success at Kerala, she modestly gave the entire credit to her Coach Mr. Yogesh, the School and her ever supportive parents for constantly encouraging her. Kudos to the young Icon in her journey! Cicelia has proved that “the strong survives but the courageous triumphs” !! held at Manchariyal, Telangana from 18 to 23 Jan. 2015. 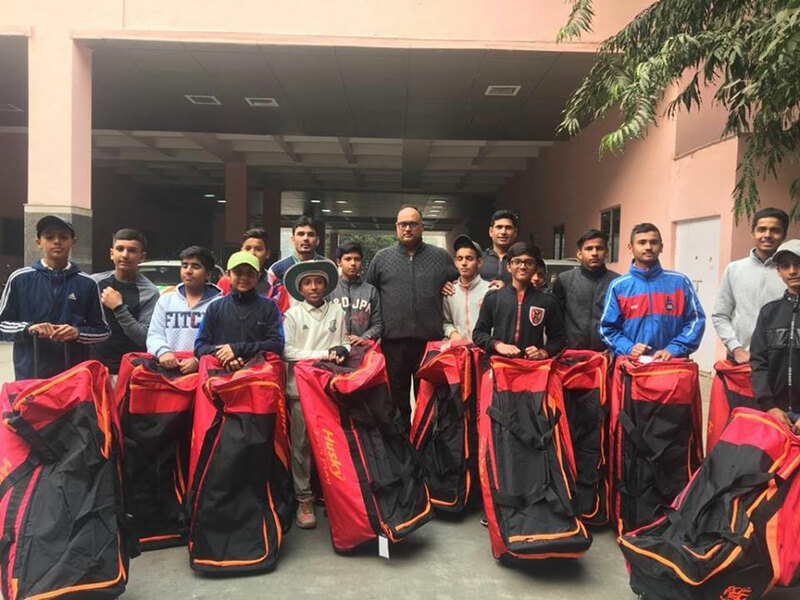 Shaurya Chhikara of class X B secured First Position and won a Gold Medal in 60th National School Games in the Net Ball Boys under - 19 category and represented Delhi. Congratulations to the budding Net Ball Player ! 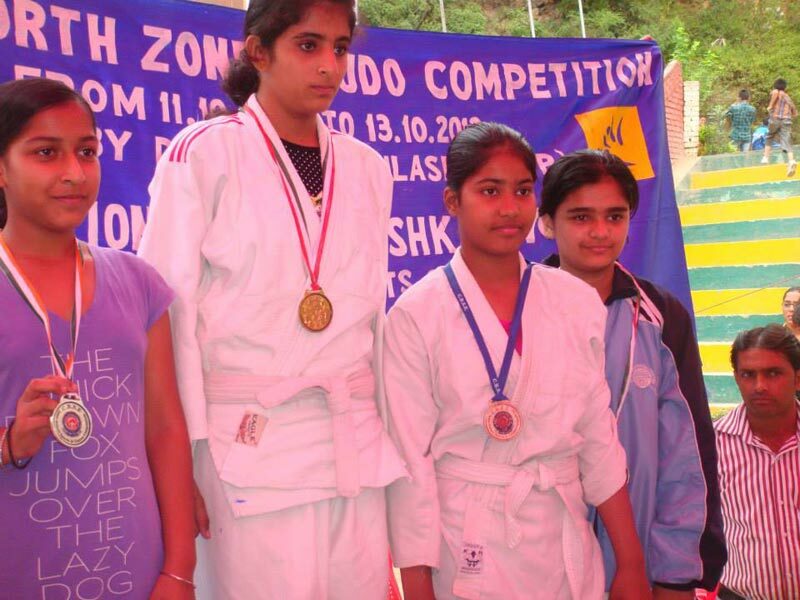 In the CBSE National Judo Championship (2014-15) held at Shanti Niketan Vidyapeeth, Meerut from 2 to 6 Jan. 2015, Vanshika Garg of Class IX E - won Bronze Medal in Below 55 kg. 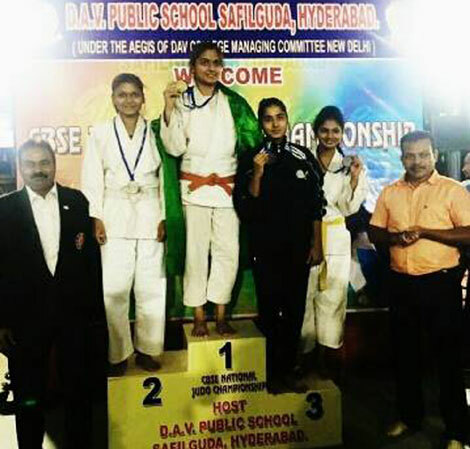 Girls Category and Kriti Gupta of Class XII A - won Bronze Medal in above 65 Kg. Girls Category. 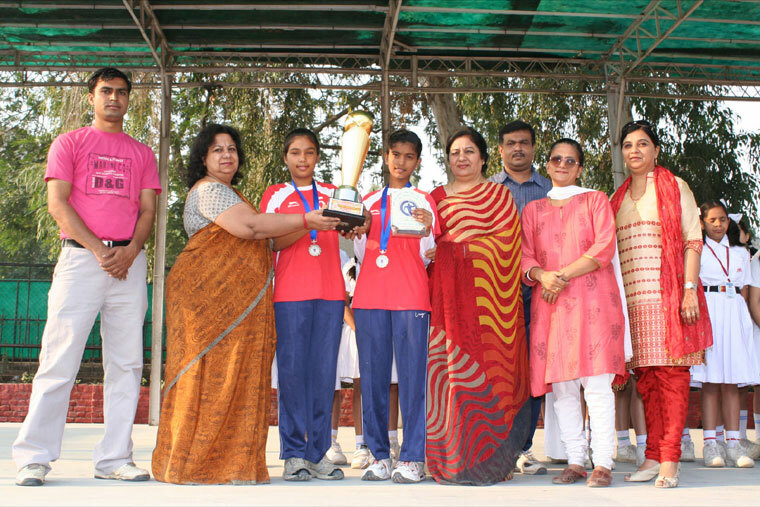 In the 59th Sub Junior School National Handball Tournament (SGFI) held at Delhi State at Pitampura. Our school sub-junior girls won gold medal and also the cash prize of Rs. 10,000/- each. In this tournament 28 states participated giving our girls a tough fight till finish. 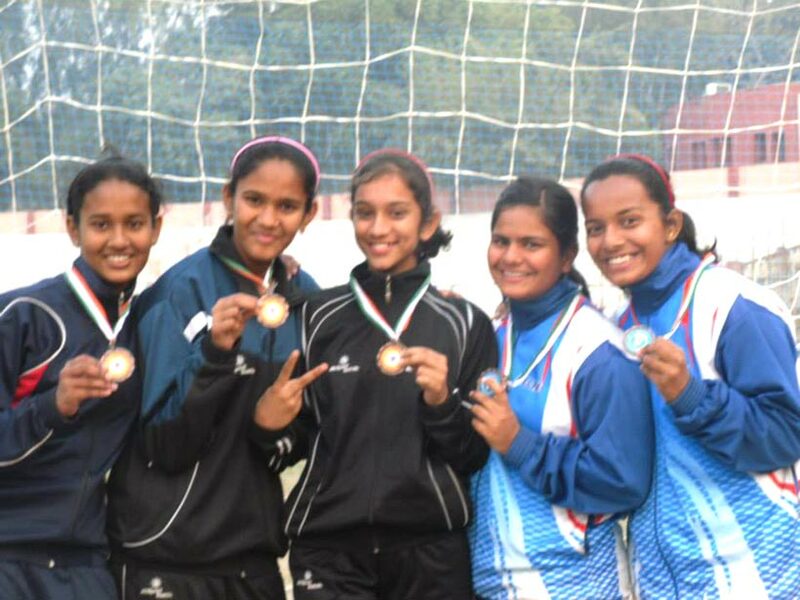 Our Junior Girls Team (U-17) participated in Delhi Handball Tournament held at Bilaspur in Himachal Pradesh in the U-17 category and represented Delhi (16th – 21st December 2013). The participants were : Harshita Joshi, Anjali Solanki, Darpan Goyal and Muskaan Aggarwal, Mansi Tomar. Our Senior Girls Team participated in the U-19 Handball tournament held at Bilaspur, Himachal Pradesh and represented Delhi State. Participants were : Meghna Kandwal, Swabhi Gupta & Srijla Bagai. 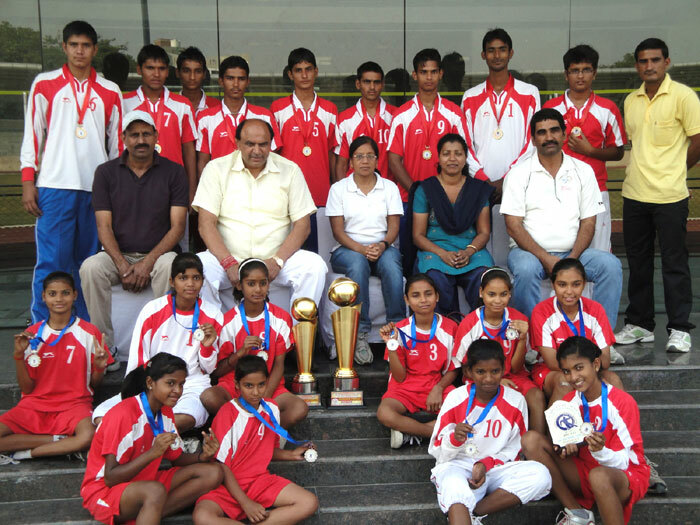 15th Mini Handball Championship (U-12) held from 17th – 22nd December 2013. In the 15th Mini National Handball Championship held at Lucknow (UP) our school team won bronze medal outshining contestants from 18 other states and also won the cash prize of Rs. 5000/- each. Our school girls participated in the 29th Open Handball Championship (Sub-Junior) held at Tamil Nadu (Karur) and won III Position & also the cash prize of Rs. 7,000/- each. 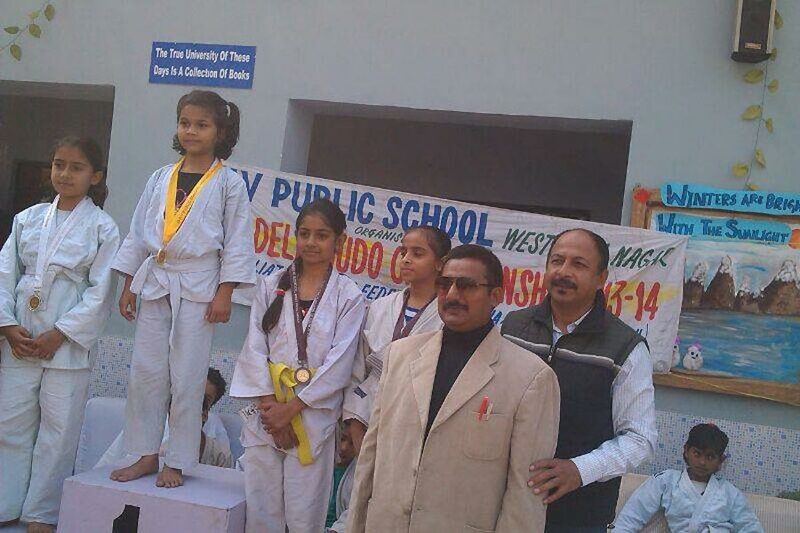 In the Open Delhi National Judo Championship organized by DAV Public School, West Patel Nagar from 20 to 23 November 2013, our girls brought many medals home and made us proud. CBSE National Judo Championship was organized by Bhavan’s SL Public School, Amritsar from 6 to 9 November 2013. 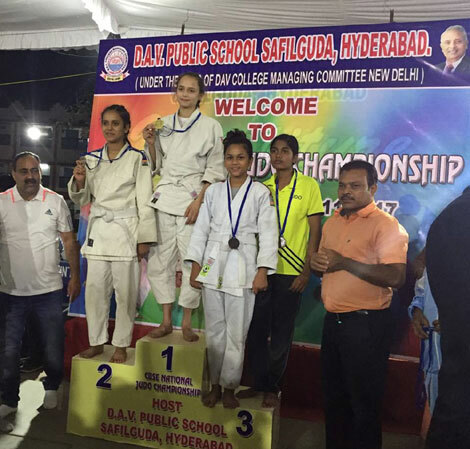 Two of our students Sanchita Bhatia (XI-E) and Kriti Gupta (XI-A) participated in it and Kriti Gupta by winning a silver medal facilitated the school flag to fly high. 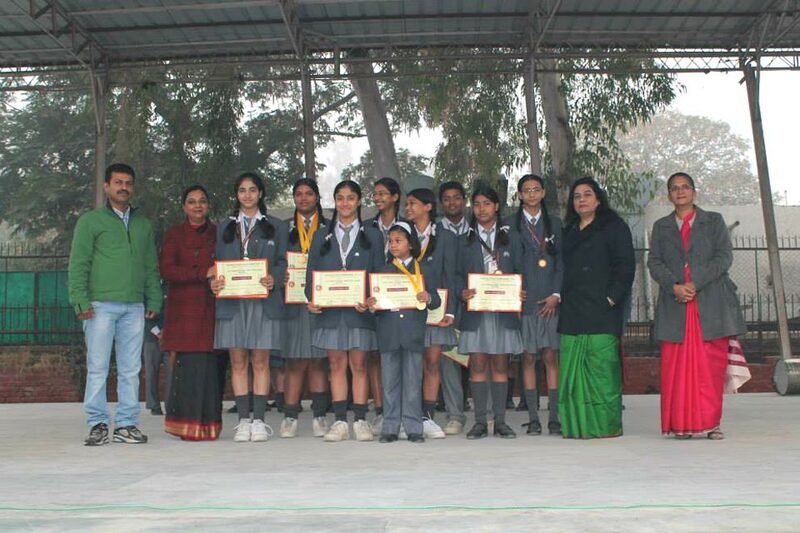 The Handball Champions of our School also participated in the CBSE North Zone Championship for Under-14 and Under-19 Girl’s Category held at G.A.V Public School, Kangra, Himachal Pradesh from 27 to 29 October 2013. The Handball teams of both the categories won I Position in the tournament. The Senior Girls’ Team was headed by Swabhi Gupta (XI C - Captain). The other team members were : Srijala Bagai (XI A - Vice Captain), Mansi Tomar (X C), Darpan Goel (IX E), Harshita Joshi (IX E), Ciceilia M. Thomas (IX E), Anjali Solanki (IX B), Anushka (IX B), Muskan Aggarwal (IX B), Nidhi (X F), Achint Kaur (VIIi C), Vibhuti Sharma (X B) and Meghnaa Kandwal (XI B). 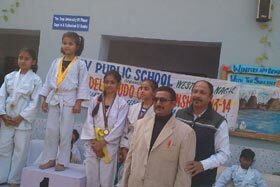 The Sub Junior Girls’ Team was headed by Muskan Kandwal (VII E - Captain). 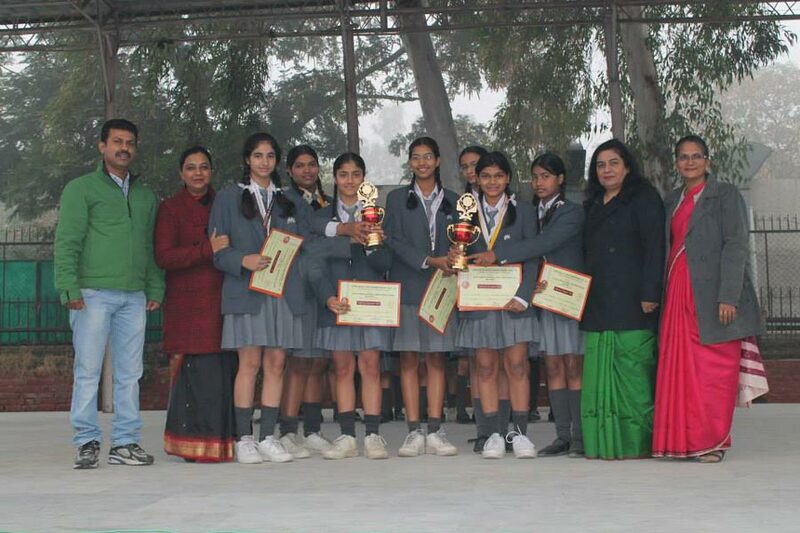 Tripti Verma (VII B - Vice Captain), Nimisha Setia (VII F), Shagun Kumari (VII E), Mansi Goel (VII F), Shruti Kandwal (V F), Khushi Kandwal (V C), Neha Sarkar (V E), Janvi Kalra (VI C), Jiya Dembla (V E), Tapsi Goyal (VI C), Aishwairya Lenin (VII C) and Jayati Garg (VI B) were the other team members. 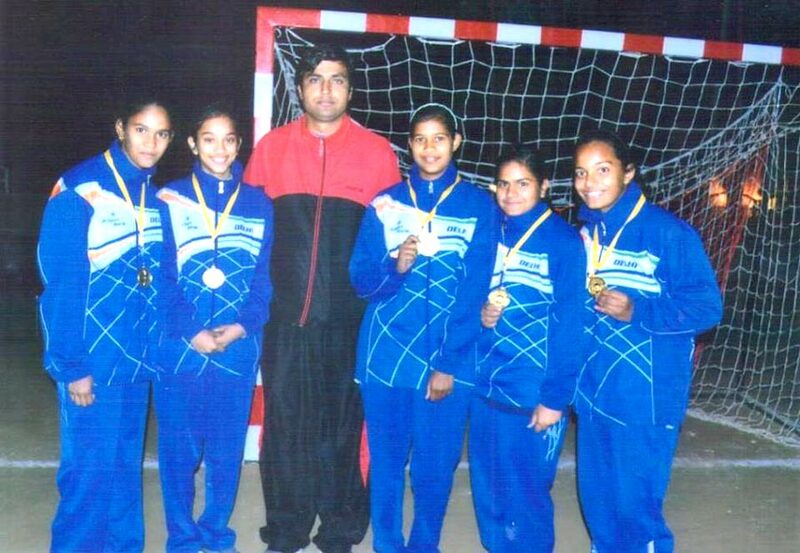 Our handball players Meghnaa Kandwal of XI-B and Anjali Solanki of IX-B got selected in the Delhi team for the North Zone Handball Championship held at Pitampura – FU Block from 19th October to 23rd October 2013 and their team bagged the First Position. 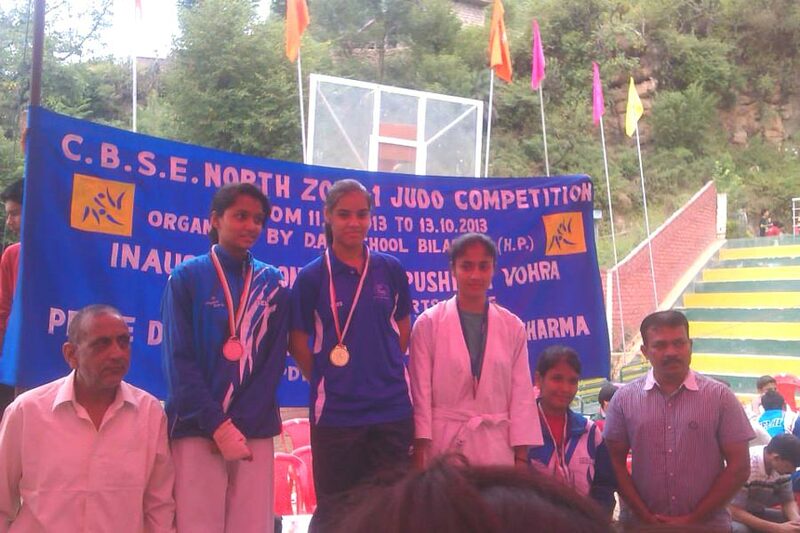 Students of our school showed their exceptional physical agility by winning Gold, Silver and Bronze Medals at DAV school, Bilaspur in CBSE North Zone 1 Judo Championship held from 11th - 13th October 2013. Our school students participated in 17th Inter Zonal National Handball Tournament held at Bhillai, Chattisgarh, and got IV Position. 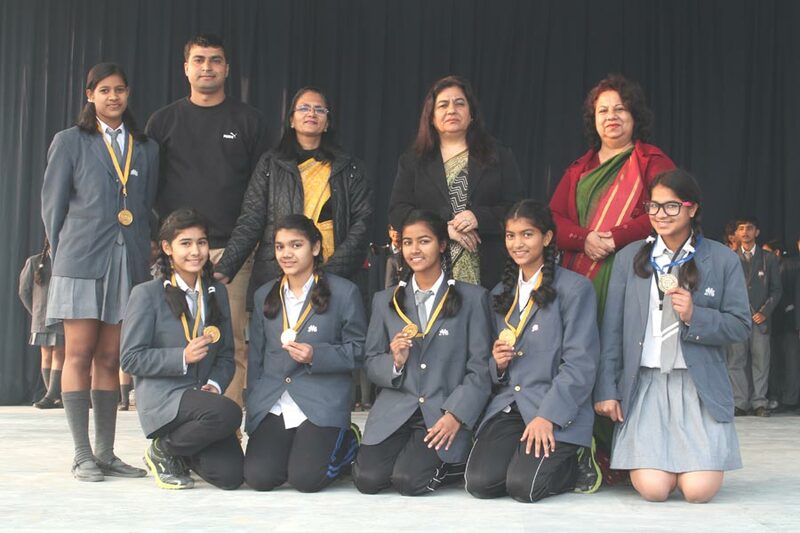 The team consisted of Swabhi Gupta (XI-C), Harshita Joshi (IX-E), Cicelia Mohan Thomas (IX-E), Meghna Khandwal (XI-B), Mansi Tomar (X-C), Anjali Solanki (IX-B). India’s best 21 players in the Under-19 Category were selected to attend the ‘International Camp of India’, at Gandhinagar, Gujarat. 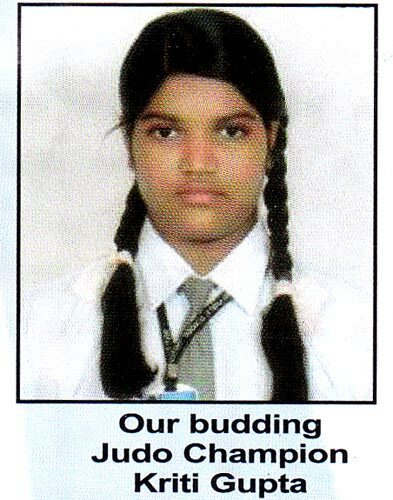 Meghna Khandwal from our school was the youngest player of the Camp and ranked 17th. Her game was well appreciated and given a cash prize of Rs. 5,000/- and a kit bag of Adidas. It is a matter of great pride that her name has been nominated for Junior Asian Games. We wish her more laurels! All India Federation Cup was held at Jaisalmer, Rajasthan from 7th to 11th September 2013. 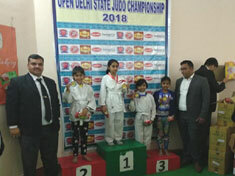 Meghnaa Kandwal was selected in the Delhi team and the team secured the Third Position. Kriti Gupta of Class X-A won Bronze Medal in +52 Kg. Wt. Category held at Sapience School, Vikasnagar, Dehradun. 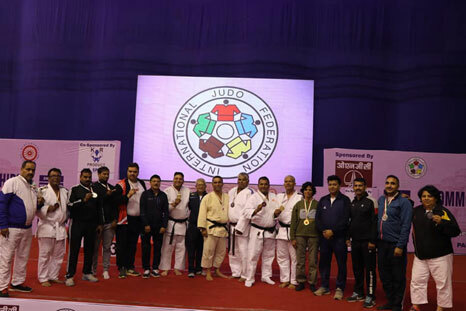 First Delhi State Kotakas Cup was held by International Karate Federation of India. Deepanshu Rohilla of IV B participated under individual category and achieved Bronze Medal. 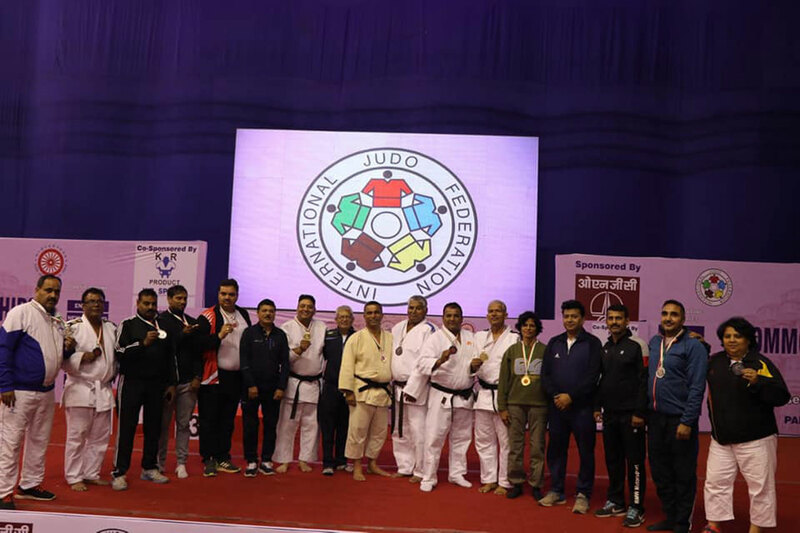 The competition was held at Jindal Auditorium at Shalimar Bagh, Delhi. 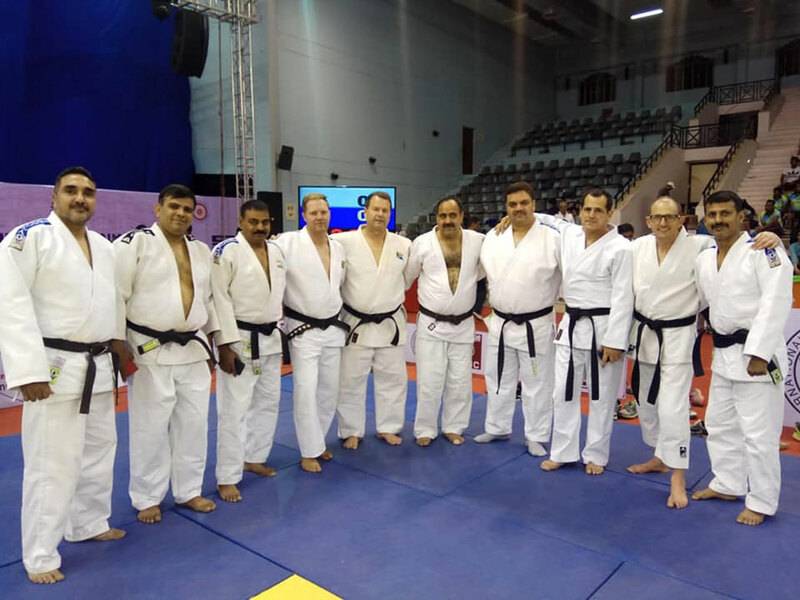 A healthy mind in a healthy body is the motto of our Judo Team. 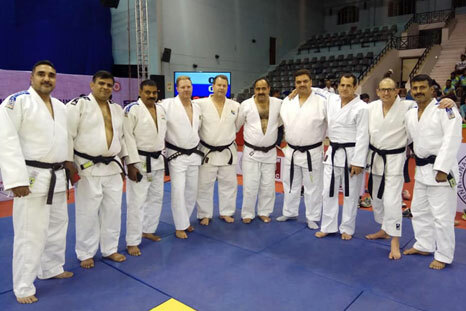 Our students participated in various Judo Competitions and excelled. 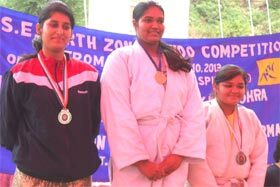 Kriti Gupta of IX A participated in the above 63 Kg. 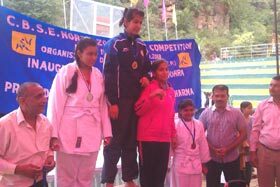 category in the National Judo Championship and she also participated in CBSE North Zone Judo Championship and won a silver medal. 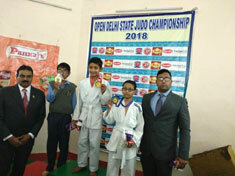 Students of our school had participated in Open Delhi State Skating Championship 2012 held at Dwarka Sports Complex on 13 October 2012 and won 4 medals – 1 Gold, 2 Silver and 1 Bronze. Students of our school had also participated in CBSE North Zone-1 Skating Championship 2012 held at Summer fields School, Kailash Colony, Delhi held from 5th to to 7th October 2012. Congratulations to Sub Juniors Team for securing I Position with a cash prize of Rs. 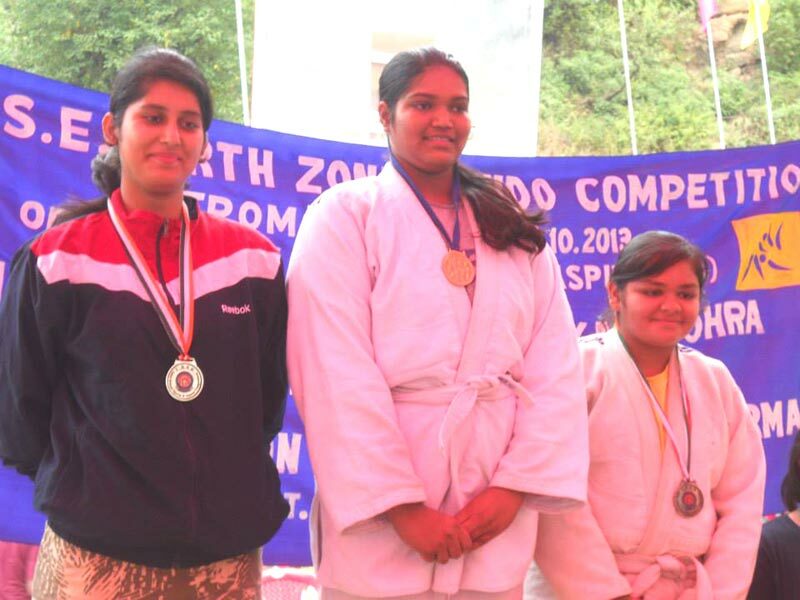 1000/- each in the Inter Zonals held at Kendriya Sarvodaya Vidyalaya. 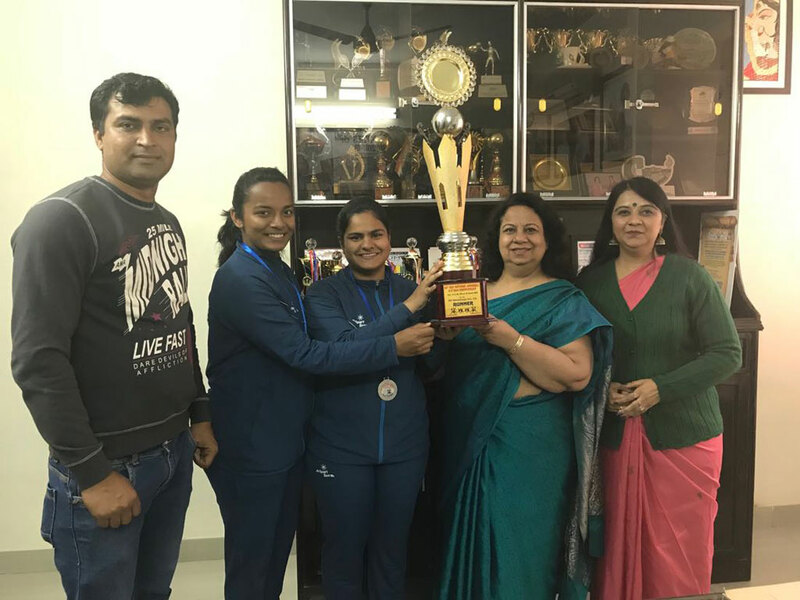 The team comprising of Cicelia, Darpan, Muskan K, Muskan Aggarwal, Anjali Solanki, Tripti, Nimisha, Shagun, Achint & Anushka also bagged the Trophy. Our Junior Team secured the first position with a cash prize of Rs. 1000/- each and also bagged the trophy. 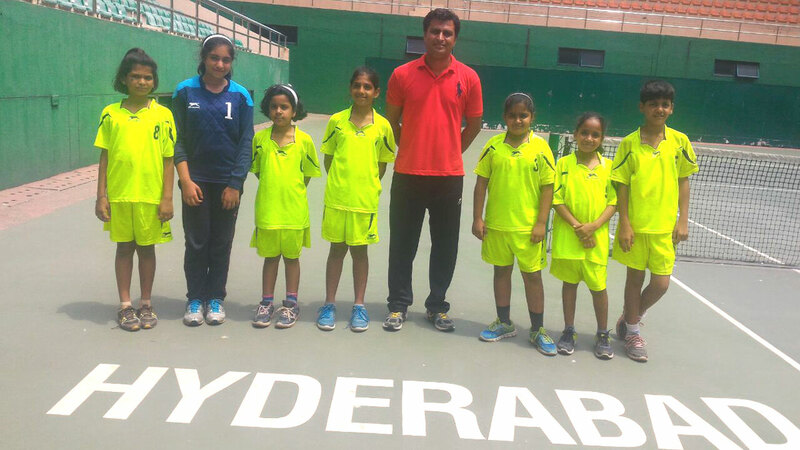 SUB JUNIORS : Cicelia, Darpan, Muskan K, Muskan Aggarwal, Anjali, Tripti, Nimisha, shagun, Jaineeta, Achint & Anushka. JUNIORS : Swabhi, Meghna, Mansi, Srijla & Harshita. 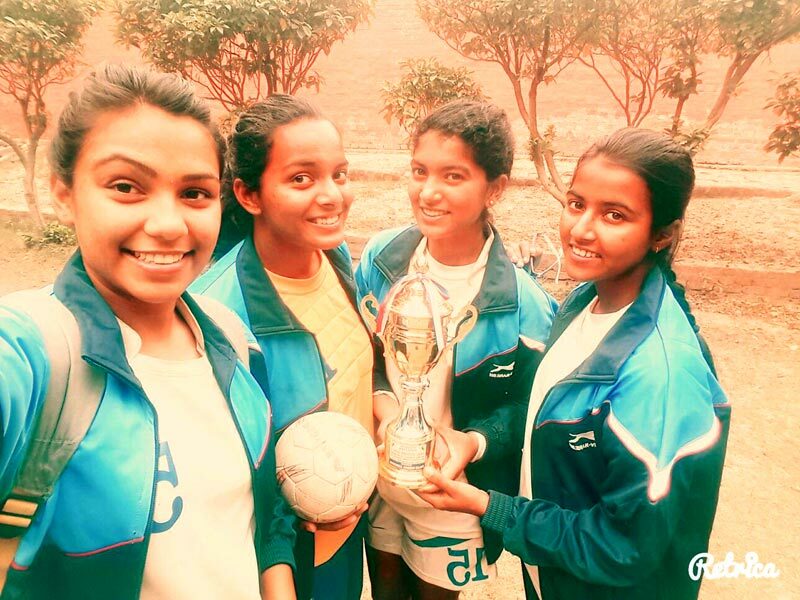 Our School’s Handball Teams Rock by winning the Sub-Junior Girls and Junior Girls Inter-Zonal Handball Titles. The Sub-Junior Girls (Zone-18) defeated Zone-10 with a score 11 – 01 and the Junior Girls (zone-18) defeated Zone – 19 with a score 11 – 06 which was held at Sarvodya Vidyalaya, FU – Block, Pitampura, Delhi. Each player was given a cash award of Rs. 1000/- by the Directorate of Education, Sports Branch. Our Sub – Junior Handball Team has done us proud again. 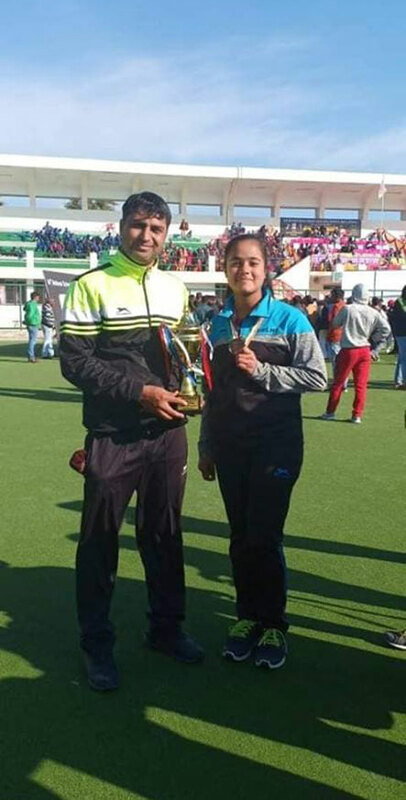 Our girls were selected in the national team of Delhi and went to Himachal Pradesh for 29th Sub-Jr. Open National Girls Championship and bagged third position by defeating Chandigarh in semi – finals. 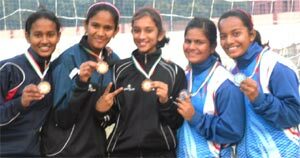 57th National School Games Handball Championship - 2011-2012 (Sub Junior Girls Team) under - 14 which was held from 28 December 2011 to 3 January 2012. Our school's team won the I Position (Gold Medal). 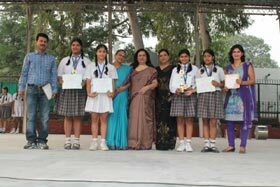 Five students were selected in the Delhi Team from our school, they were : Samriddhi Chopra (VIII D), Mansi Tomar (VIII B), Harshita Joshi (VII B), Cicelia Mohan Thomas (VII B), Anjali Solanki (VII E). 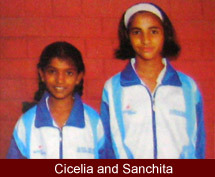 Meghna Khandwal of IX D and Swabhi Gupta of IX E participated in Handball Junior School National Game 2011-12 and represented Delhi in Chattisgarh. 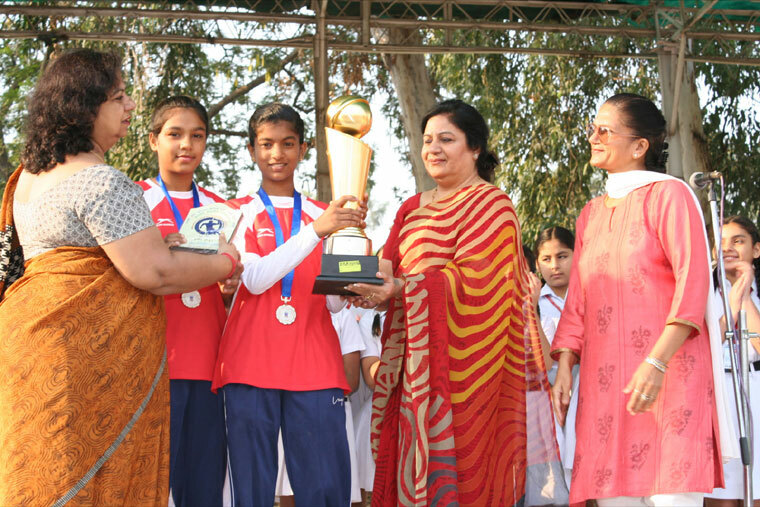 Our school won the II Runners Up Trophy and Cicelia Mohan Thomas of class VII B was declared as the Best Player Of the Tournament in the National Handball Championship held at Goenka Public School, Sikar, Rajasthan for the Sub Junior Girls. It was pure magic woven in the Jawaharlal Nehru Stadium Indore, M.P as the ‘young players’ of our school Cicelia Mahan Thomas (VII B) and Anjali Solanki (VII E) won the Runners Trophy (II Prize) in the 13th Mini Junior Girls Open National Handball Championship held from 8th to 13th October 2011. Moreover Cicelia Mohan Thomas was selected as the captain of the Delhi Team. And declared the best player of India. 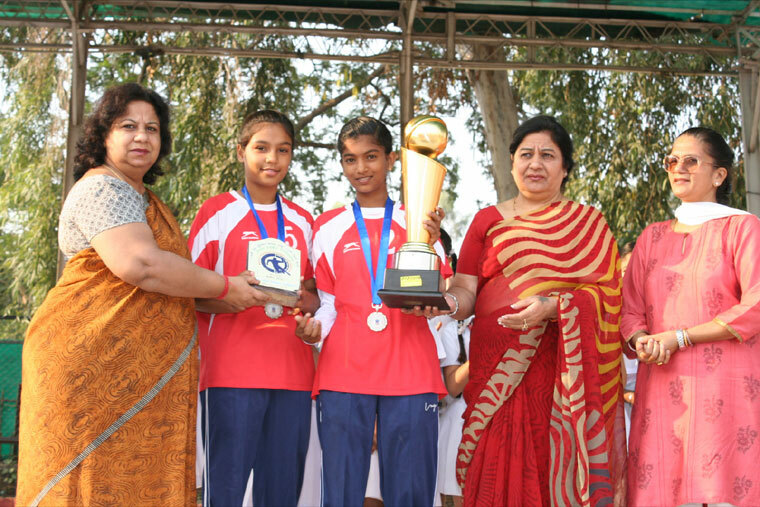 It was after 12 years Delhi got the Mini Junior Girls Open National Handball Championship Trophy. 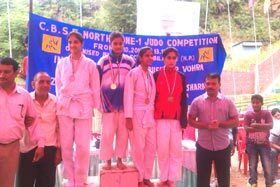 S.M.S Janakpuri bagged first position (Gold Medal) in the CBSE Interzonal North Zone–I Handball Tournament Girls (under 14 years) which was held at Yuvashakti School Sector – III, Rohini from September 30th to 2nd October 2011. 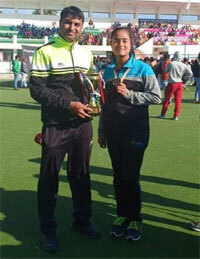 Moreover Mansi Tomar of class VIII B was declared the Best Player of the tournament. Our school Sub Jr. 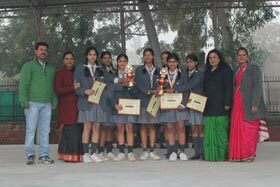 Girls Team bagged the first position in Handball Inter-zonal Tournament held at Pitampura. Congratulations to the entire team. CICELIA MOHAN THOMAS, SAMMRIDHI CHOPRA, ANJALI SOLANKI, HARSHITA JOSHI, SWABHI GUPTA and MANSI TOMAR. It was a moment of elation for all of us when four girls of our Hand Ball Team were selected for playing in the National matches. Mansi Tomar (VII B ). The girls were also awarded a cash prize of Rs. 10,000. 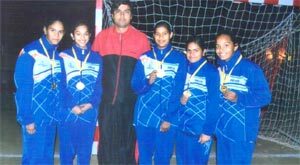 Three girls from our school were selected in the Delhi Team for the Open National Handball Championship under the Mini Junior Girls’ category (Under-12) which was held at Lucknow from 20 May 2010 to 28 May 2010. Cicelia Mohan Thomas was selected as the Captain of Delhi for the same. Meghna, Swabhi, Kriti, Cicelia Mansi, Sanchita, Samridhi, Yashi, Akansha won the Runners Up Trophy as Sub Jr. Girls Handball Team. Jr. Boys Handball Team won the Runners Up Trophy. The team comprises of Sidharth, Akshay K., Varun, Tushar, Yatin, Tejas, Rishi, Shrey, Anurag, Utkarsh and Mohit. Ambuj, Ashish, Gurmeet, Sarabjot, Jatin, Vaibhav, Shubhang, Rohan, Shubham, Somya, Ujjwal and Rachit bagged the Winners Trophy of Sr. Boys Handball. Cicelia of Std. V and Sanchita of Std. 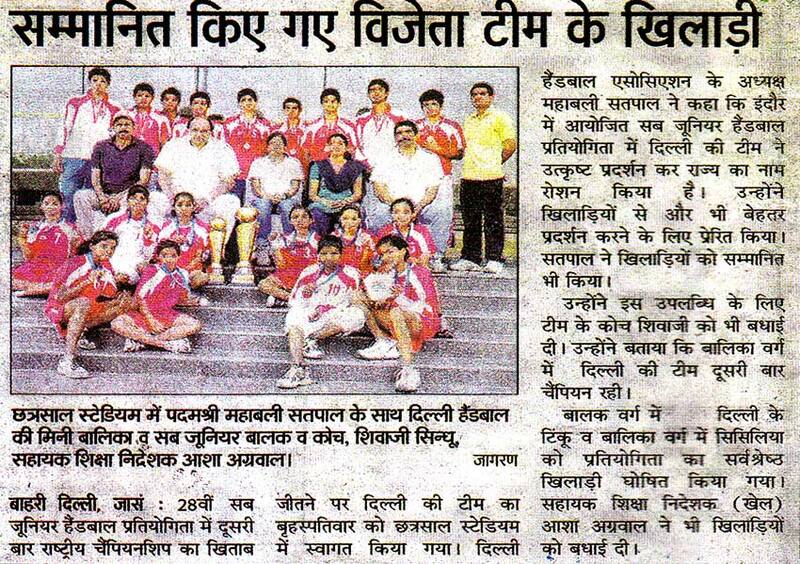 VII were selected to represent Delhi State in under 14 years category in Handball Nationals Tournament held in Kolkata. 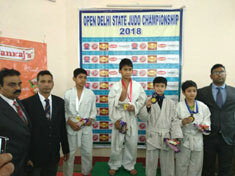 Delhi State bagged the Runners Up Trophy. Swabhi Gupta (VII B) was selected from Delhi State for Mini Jr. School Nationals (Handball) held in Chennai. Sub. Jr. 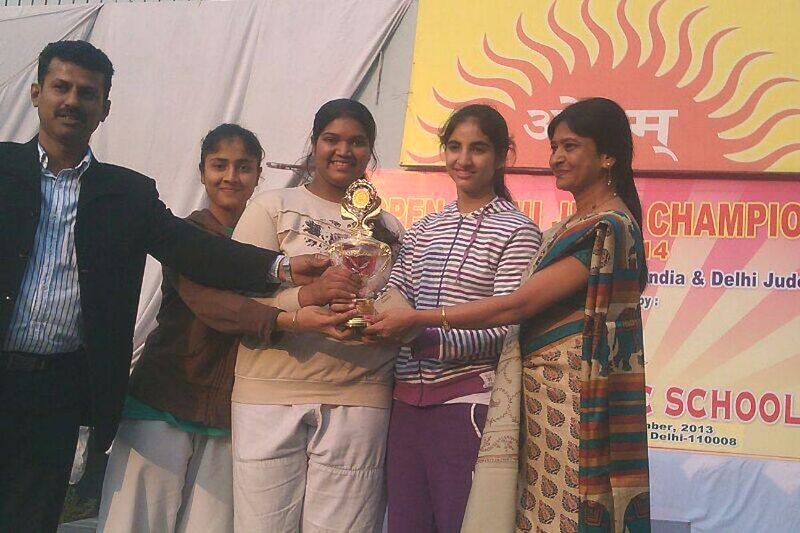 Girls participated in CBSE Tournament held at Chandigarh from 6th to 12th October and won II prize. The Sub Jr. 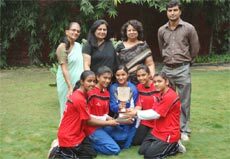 Girls Team of Handball was Runners Up in CBSE Tournament held in B.S.F. Sr. Sec. School, Jammu. 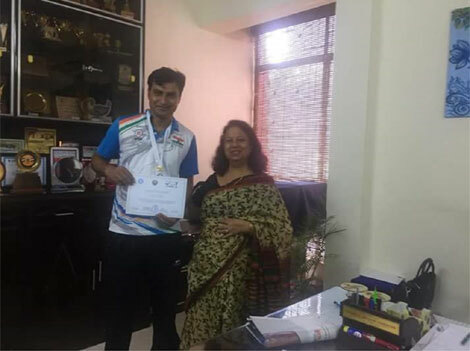 Sarthak Kedar of V A participated in the Delhi YMCA Invitational Sub Junior and Aquatics Championship and he secured II Position in 200 meters Individual Medley and 15 meters Butterfly Stroke. 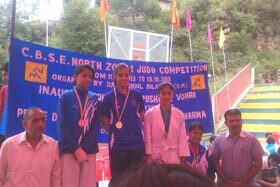 Secured third position in Delhi State Swimming Championship in the year 2011 in the month of July 2011. Secured fourth Position In Delhi State Level Competition in his age group in 2010. Sarthak Kedar of Class V A won a Bronze Medal in South Delhi Swimming Championship in the Year 2010. Sub Jr. 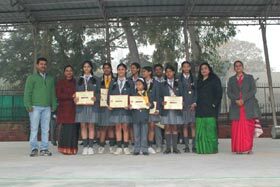 Girls attended Inter Zonals at Pitampura from 28th November to 3rd December and won laurels for the school by bagging the Ist Position. Each participant was was given a cash prize of Rs. 1000. 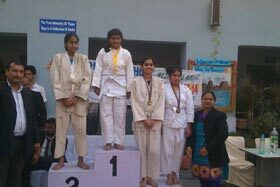 50th Delhi State Gymnastics Championship was held from 14th December to 18th December 2010. Master Mohd. 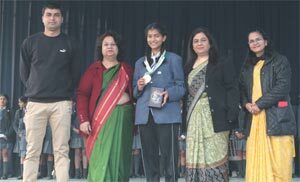 Isa Anwar of class IV A participated in a number of events and brought laurels for the school. 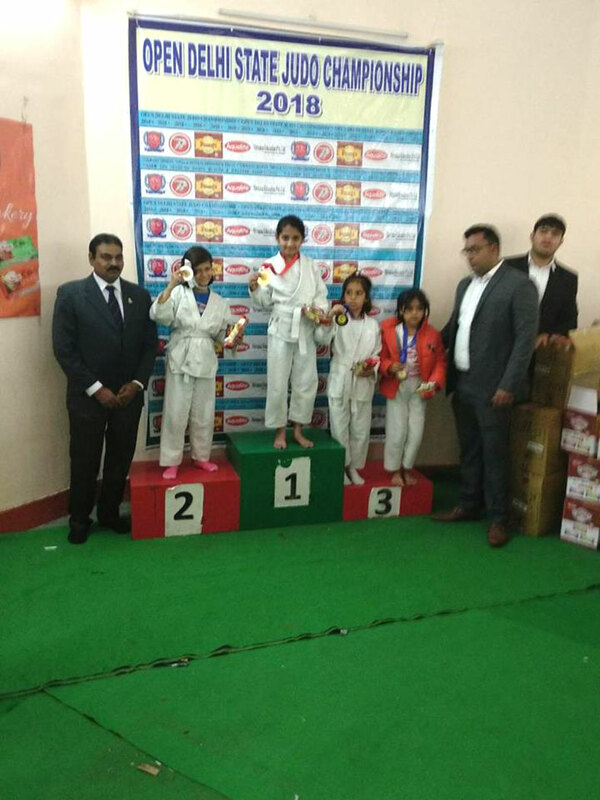 24th Sub Junior Artistic Gymnastics Championship was held at SDAT – Jn Indoor Stadium Chennai Tamilnadu from 27th to 31st December Mohd Isa Anwar of class IV participated as a player under 10 category. UP Roller Skating Association had organized ‘National Roller Skating Open Championship’ from 28th to 31st January 2010. Our School Primary Children of classes - I to V participated in the Athletics Meet Zonals which was held on 23rd of October 2009. Number of schools participated in the Athletics Meet. In this Meet our school got number of medals. Following are the names of the students. Mohammad Isa Anwar of II A participated in 47th Delhi State Gymnastics Championship 2007-08 held from 4th Feb. to 8th Feb. 2008 organized by Delhi Gymnastics Association. He won the Gold Medal under 7 year event Gymnastics (floor). He will also be awarded a cash prize of Rs. 2500/- by Educational Directorate (Sports Branch). 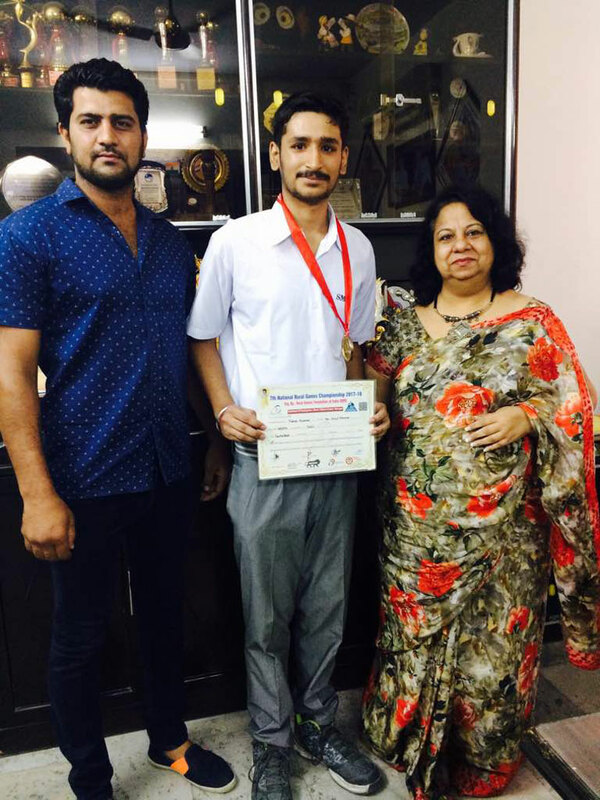 Mohammad Isa Anwar participated at Zonal Talent Search Comeptition in the month of September and bagged II prize. He was also given a cash prize of Rs. 1500/- under 10 yrs event Gymnastics (Floor and Vaulting). We are indeed proud of them. 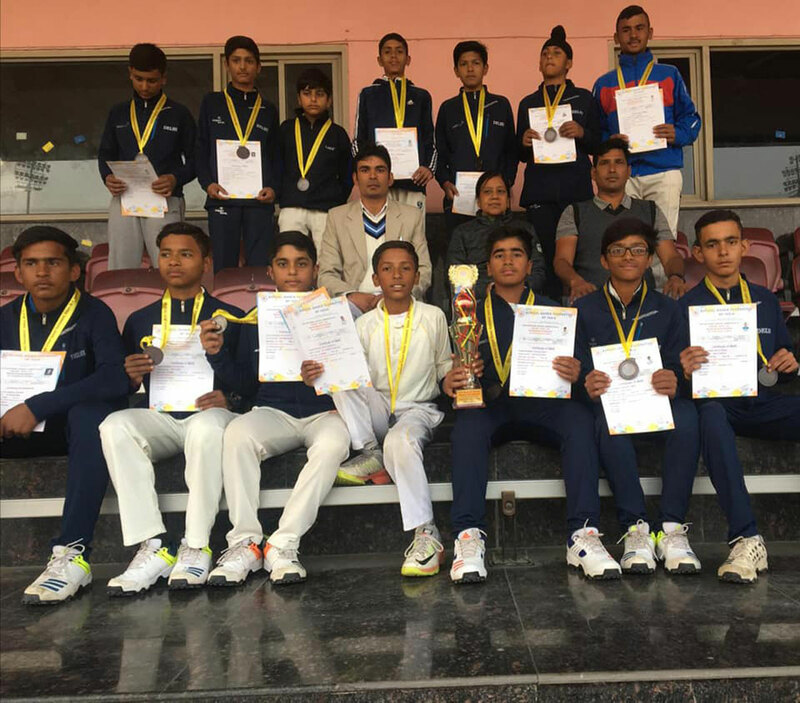 Abhishek Dadwal (X D) participated in Nationals (Cricket) under 16 years held in Sri Nagar for Delhi Team and got first position. 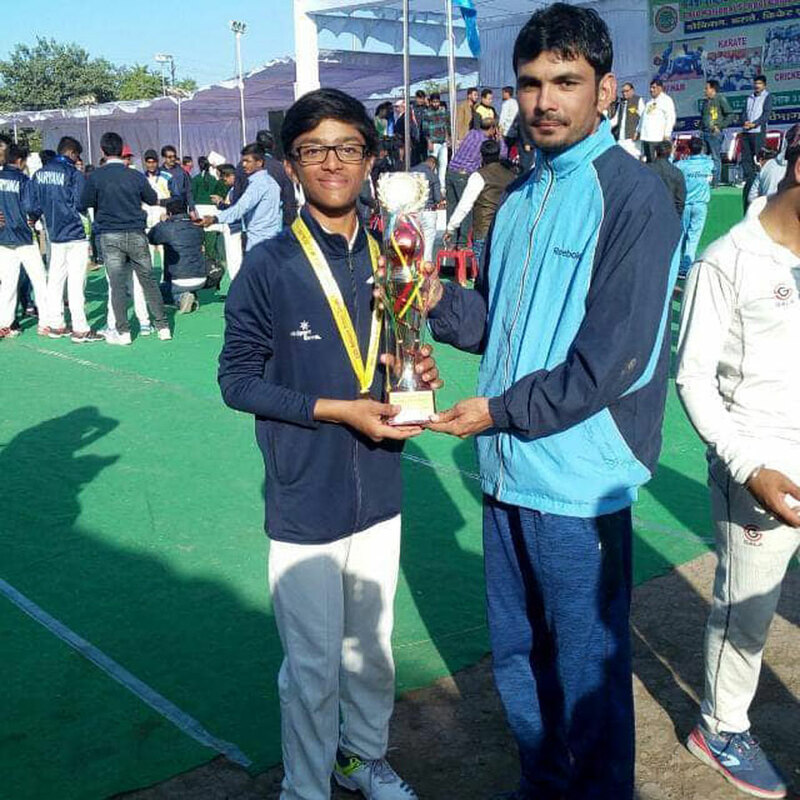 Tejas Ahlawat of class IX D participated in Commonwealth Games in Cricket in under 16 years category held in Delhi. Inter School Throw Ball tournament were held at Zonal Level at our school from 25th to 27th August 2008. The matches were conducted at Sub. Juniors & Seniors (only for girls) level. 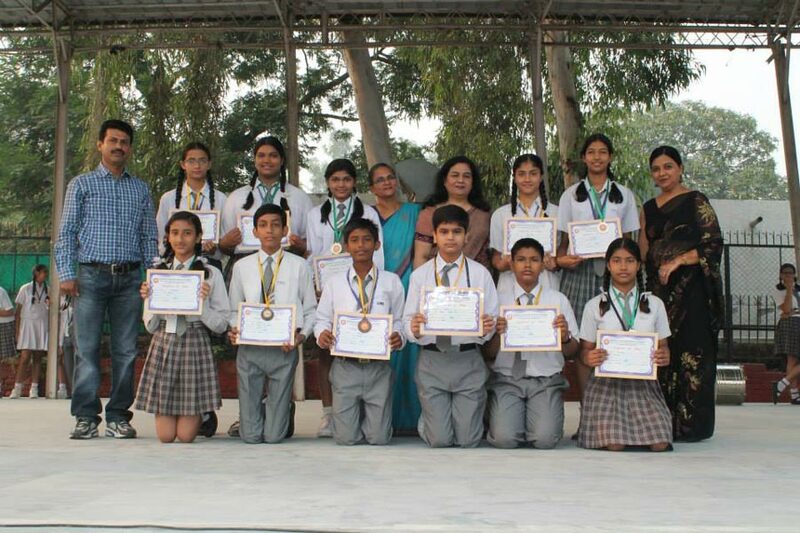 Sixteen schools participated in it and the winners from different schools were felicitated.